Big and Tall users of desk chairs are in for a real surprise - there's a chair designed just for them that combines the best in functionality and style while not skimping on ergonomics - the Nightingale CXO 6200-HD Mesh Back Chair for Big and Tall Users. The Nightingale CXO 6200-HD Mesh Back Chair for Big and Tall Users features a heavy-duty seat with a breathable mesh back, and a steel reinforced frame that's capable of supporting up to 450 pounds. Its resilient ENERSORB foam seat cushion molds to your body and encourages proper circulation, making even the longest day at work just a little comfier. The CXO 6200-HD Mesh Chair for big and tall users is a durable seat option for those looking for a unique seating solution that supports them in all the right places. Upgrade your chair and feel the difference from the first seat. What's Different About The 6200-HD? 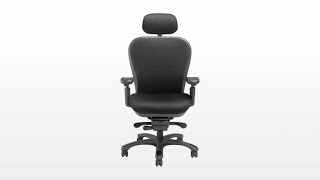 The Nightingale CXO Chair 6200-HD can be ordered with or without a headrest. This headrest has been completely redesigned to be easier to maneuver. Nightingale CXO Chairs are available in fabric or leather upholstery on the seat, headrest, and lumbar support. The fabric used for the seat on the Nightingale CXO mesh back chair is 100% polyester and has the WS cleaning code. It can withstand 100,000 rubs and will hold up for years. We recommend the standard fabric as it has 4-way stretch and offers maximum comfort with the Enersorb foam seat, plus a woven fabric will decrease the give of your seat. Choose between black or silver for the back mesh of the Nightingale CXO 6200-HD chair. Nightingale's 4D Adjustable Arms offer the most adjustability. The arm pads pivot inward or outward 30 degrees. Please Note: Non-pivoting or Width and Height Adjustable Arms are also available, but we recommend the 4D Adjustable Arms for the most ergonomic adjustment options. Opt for a standard black frame or upgrade to a polished aluminum finish to complement the styling in your work space. The black frame comes standard on the Nightingale CXO Chairs. The polished aluminum frame upgrades the finish on the base, arm triggers, back trim and casters. This chair is extremely comfortable, ergonomic features are excellent. Chair is quite heavy, that is the only con I can see. The CXO HD is a very nice chair. The seat is comfortable and the chair is very adjustable. The biggest problem is the chair back is to short - if you are over 6 feet tall the back ends in your upper back and the hard part of the back makes it very uncomfortable. There is no way to adjust the back height. The mesh is nice but with the short back I would not recommend this chair to anyone over 6 feet. Excellent build quality and comfort. Not exactly cheap, but the nicest executive desk chair I have owned. I was going to get an Aeron but found out they only fit people up to 280lbs and I'm 320lbs. Plus I read somewhere that a mesh seat isn't good for sitting long hours and I sit all day and I used to get stiff in my old chair. I've had this one two weeks and I love it. It is very comfortable. The seat is great and I can really feel the lumbar support. This is my first mesh chair and I really like the mesh back. This product comes standard with a limited lifetime warranty on all non-moving metal parts, a 10-year warranty on control mechanisms, casters, pneumatic cylinders, self-skinned urthane parts, and plastic shells, and a 5-year warranty on upholsteries. $1,130.00 List Price: $2,240.00* The list price is the same as the MSRP (Manufacturer's Suggested Retail Price). It may not necessarily be the price at which the product is sold.